SSV: Affordable Housing. Does it exist and how do you find it? 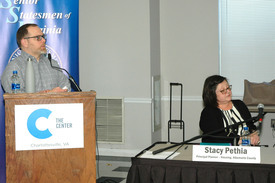 Sunshine Mathon (left) and Stacy Pethia speaking at The Center in Charlottesville. What are the roles of the City and County in the growth of affordable housing? Does location matter? “Rural vs. Urban” or “Rural plus Urban?” What can they do to help. Find out in this interesting podcast. Stacy Pethia and Sunshine Mathon spoke at the Wednesday February 13, 2019 meeting of the Senior Statesmen of Virginia. The meeting was held at The Center in Charlottesville. Following the presentation, questions were taken from the audience. The program was moderated by SSV board member Peppy Linden. Representatives of the Charlottesville Area Alliance discuss the mission and vision of the Alliance, to be the most age-friendly community in the country. The panel speaking at the Senior Center in Charlottesville. Marta Keane has been the CEO of JABA since April 2013. JABA works to help people age in community, by providing a Continuum of Caring for the Continuum of Living. Her entire career has been on helping seniors achieve the highest quality of life, in the place of their choice. She believes in creating a community that honors and respects the gifts that seniors have to offer. Brad Sheffield serves as the executive at JAUNT Inc. He has been working in the transit industry for 16 years, in both public and private transit planning roles. From January 2014 to December 2017, Brad served on the Albemarle County Board of Supervisors representing the Rio Magisterial District. He is passionate about helping communities foster the traditional characteristics that make places great to work, raise a family, and retire. Rebecca Schmidt is the population health manager for the Thomas Jefferson Health District serving the City of Charlottesville and the five surrounding counties. Over the past 15 years, she has worked in health policy, program development, implementation and evaluation for nongovernmental agencies and for local, state, federal and international government. She holds a B.A. from Boston University and an M.P.A. in Public Administration from the London School of Economics and Political Science. Peter Thompson has served as executive director of the Senior Center Inc. since 1999. The Senior Center positively impacts the community by creating opportunities for healthy aging through over 100 programs and scores of partnerships. Peter received his B.A. from UVa and his MPA from Virginia Commonwealth University. Recent community service includes serving on the Board of Directors of the OLLI at UVa, Chamber of Commerce, and the Center for Nonprofit Excellence. The event took place at the Wednesday February 14, 2018 meeting of the Senior Statesmen of Virginia. The meeting was held at the Senior Center in Charlottesville. Following the presentation, questions were taken from the audience. SSV President Rich DeMong moderated.